A new hero for the upcoming version! Although I like the sound of ‘a mysterious supporter’! This entry was posted in Feature on December 17, 2015 by Andy. 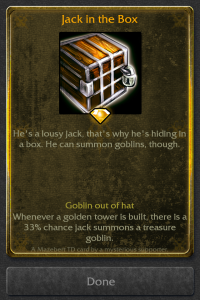 nice one but what if i got a treasure goblin on the first round.. it’ll be frastuating since theyre hard to kill and first tower is always week. Luck poition + 4lucky pants+ dungeon door+ jack in the box = ??? It is a hero. Not a tower.